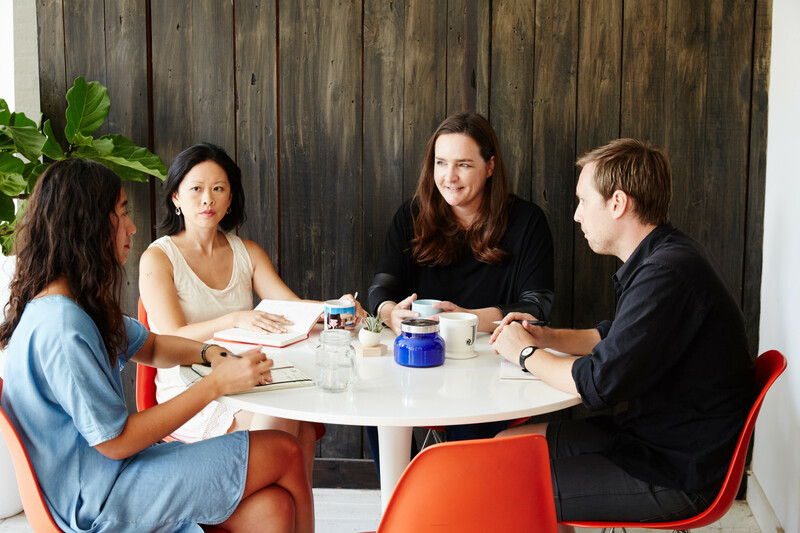 According to Tina Roth Eisenberg, there’s no better demonstration of the companionable spirit at her Boerum Hill co-working space, Friends, than the scene that unfolds at lunch. Between 12 and 1, people leave their computers and trickle in from the neighboring room, filling the large wooden table opposite the kitchen with a hodgepodge of leftovers and local takeout. The room fills with the clatter of forks and knives. Bites are shared. Dogs, who accompany their owners to work daily, rest in sunlit triangles near the window. This is what Tina refers to as her happy place: a manifestation of a vision of community that the designer’s held dear since arriving in New York City in 1999. 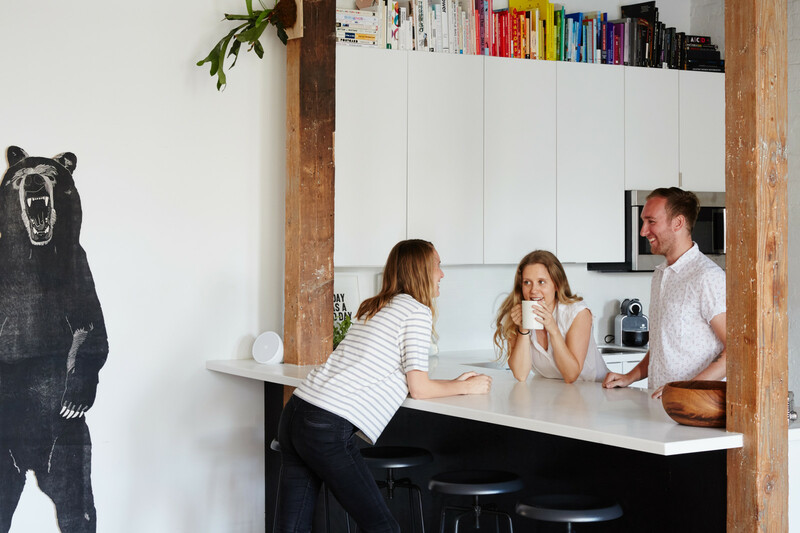 It also serves as the headquarters of her two growing companies, temporary tattoo emporium Tattly and the international lecture series CreativeMornings. 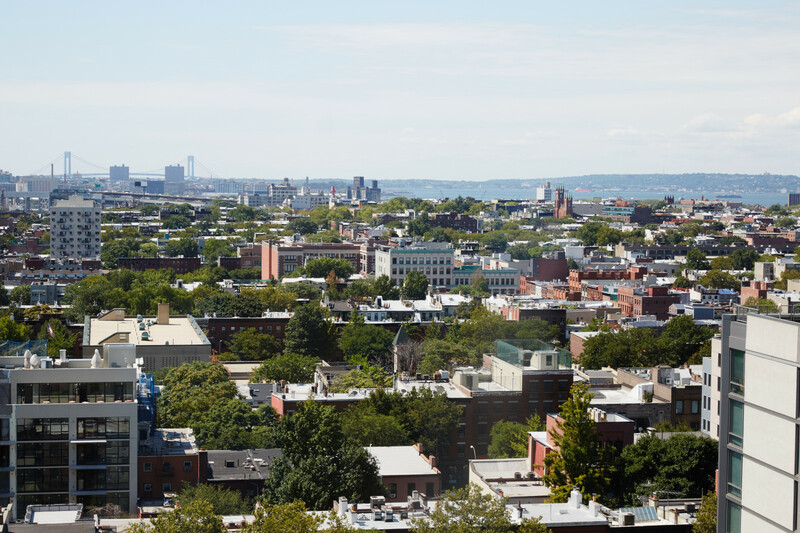 It’s a place she, her husband and two young children consider a second home – and, happily, it’s only minutes from their real one, which is located in a nearby high-rise with views of Downtown Brooklyn. “I’m very lucky,” she says, sipping coffee outside neighborhood bakery One Girl Cookies. “To have my family, this community, to be doing what I’m doing.” She smiles at passersby, rising to her feet. “It makes me so happy.” Then, hair swinging and feet on the verge of a skip, she rounds the corner, homebound. This portrait is part of our ongoing series with Vitra. Visit Vitra Magazine to find out more about Tina’s approach to interior decoration. Since you arrived in New York City at the age of 26, you’ve launched a blog, two workspaces, an international lecture series, an organizational app, and a temporary tattoo company. What’s your job description, in your own words? What were you like when you were her age? Have you always had a creative — or an entrepreneurial — spirit? I think it was clear that I’d pursue some sort of creative career. As a teenager, I ran the school newspaper. I helped coordinate cultural events. I designed posters. I was very involved. Now, I can see both the graphic designer and the entrepreneur in the making. And the fact that my parents were both entrepreneurs, too, had an impact on me – I was never afraid to start a new project. In my world, that was what you did. Having a regular job was not. Take us back to when you landed in NYC in 1999. You’ve said before that when you arrived for your first job interview, you were told by your boss-to-be that you’d never leave the city. Did you have the same inkling? No. I was a little insulted. I thought I would be here in New York for three months. But I took that first job and my boss was right – I never left. After September 11th, my office shut down because of the attacks. There were so many signs saying I should move back, but I remember sitting on my couch, frozen, thinking, I’m not ready to put this book back on the shelf. This is not how I’m ending my stay here. When did you transition from working for larger design studios to working on your own? Basically the day my daughter was born in 2006, I went out on my own. I was renting a desk at an architect’s office for a while, and the people were nice – but there was no room for collaborators or guests to come in for a day if they needed. I thought, I want to be somewhere where people are welcome. So I started looking for my own space. Eventually I ended up in Dumbo. That became Studiomates. Then came CreativeMornings, TeuxDeux, and Tattly. 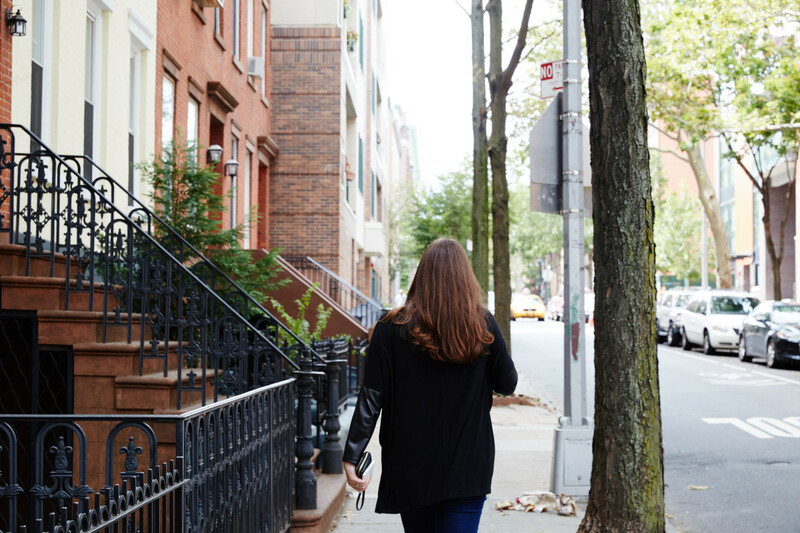 This summer, we moved from Dumbo into a new workspace in Boerum Hill called Friends. Can you envision yourself living in another city? The thing is, on one of my first days in New York, I got out of the subway and I noticed immediately that everyone walked as fast as me. Everyone talked as fast as me. I never had to put on the brakes. Then, as I started talking about everything I wanted to do, everyone’s attitude was, you can do this. All I’d felt leading up to that was resistance. When I got here, I thought, what is this? I related to the hustle. It felt like home. So, no – I could never live anywhere else. swissmiss. Tina’s much-celebrated blog, which receives an average of 1 million monthly visitors, launched in 2005. Studiomates. Next came her first coworking space, located on Dumbo’s Jay Street. CreativeMornings. In 2008, the designer introduced a morning lecture series that’s since expanded to 129 cities. Tattly. Two years later, came an artist-designed line of washable tattoos. Friends. Finally, in 2015: a brand-new space for creative collaboration. Many people leave the city once they have children. Is it difficult raising kids in New York, especially given your country upbringing? I was raised with incredible independence, and that has shaped who I am. As a child, I could just wander. I could walk far into the woods on my own. No one knew where I was. I remember that freedom. I was so proud to be on my own — I wish I could give that to my kids. Then, on the other hand, they’re exposed to so much that I didn’t have. About three years ago, I looked back on my own childhood, and I thought, what are some of the things that impressed me as a kid? What did my parents do that really shaped me? And I remembered: they had dinner parties. They’d invite their friends; there were lots of interesting conversations. As a kid, I wasn’t necessarily participating, but I was absorbing what was being talked about. We’ll come back to the idea of community in a bit, but let’s shift gears. You’re seen by the public as something of an incredible idea machine. Where do the ideas come from? I like nothing more than a good challenge. I always say, ‘Instead of complaining, fix it.’ That’s my personal rule. I kept complaining about the temporary tattoos my daughter would bring home, for instance, and that was such a no-brainer. I’m a web designer – I could make a website in no time. I had lots of illustrator friends who would be interested in participating. If anyone could do something like this for kicks, I could. So I googled how to manufacture temporary tattoos, and there you have it. That’s Tattly. You must be asked often about your proudest accomplishment. Is that a hard question? It’s actually not. First, of course, I’d say my kids. Then, it’s CreativeMornings, which has grown far beyond anything I could have ever dreamed. It was one of those things that people told me would never work. But I loved that challenge. It never occurred to me that it would spread to other cities, let alone 129. It went from a personal labor of love to a global one. As a business owner, what are the most notable differences between running Tattly and CreativeMornings? It’s interesting. I run two companies that couldn’t be more different. 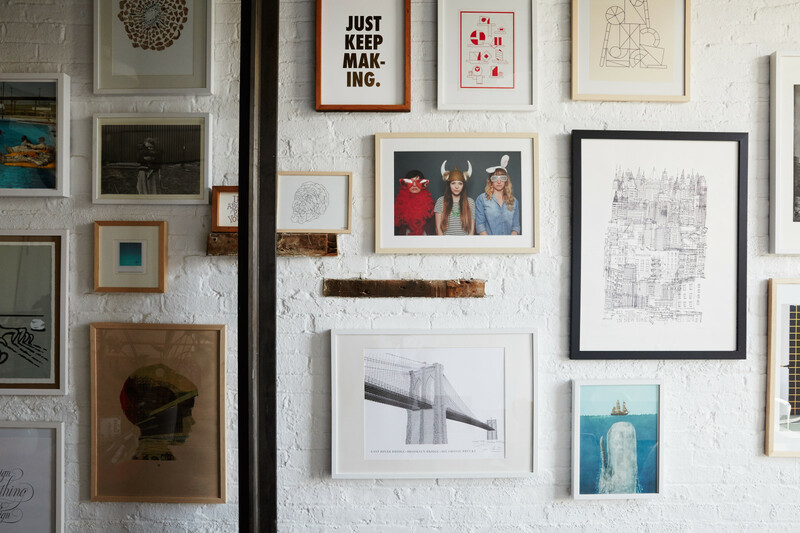 At Tattly, we sell a physical product. CreativeMornings is an idea. The funny thing is, people have this perception of Tattly – they think we’re huge. It makes me chuckle. Tattly is growing, but we’re still just making it work. We’re a very humble little company, but people have this idea that we’ve made it. I have lots of respect for others who’ve started their own brands. I’m able to see it differently. I think, they may seem big, but they’re probably just making it work, too. Have you ever experienced biases as a female entrepreneur? People are always curious about that, and the honest answer is, I haven’t. Maybe I’m oblivious. I don’t know what it would be like to be a man – maybe things would be easier if I was. But in general, New York is nothing but welcoming to strong women. I do notice that sometimes I get asked to speak at conferences because they need to fill a certain number of spaces with women. And I think, sure, I’ll fill your quota. But I make it my goal to do a really good job so that the next time, they invite me because they really want me to be there. So much of the work you do is web-based. What’s your attitude about children and technology? Do you try to limit your kids’ access to computers and the Internet, or do you encourage it? That’s a big topic among my generation of parents, because we didn’t grow up with this. We see it as something bad. But there’s already a new generation of parents now that grew up around screens, and they’re approaching it differently. I’m trying to find a balance with my kids, but I do let them spend more time on screens than other parents I know. I just tell them, you need to use it to create something. Ella just spent two weeks at a summer camp learning to code. I couldn’t be happier. This is her world. Coding will part of her vocabulary. I might have learned French; she’s learning Java. Have you always been technology-minded? My dad was Mr. Apple in Switzerland. I fought him all the time. I was always very analog. But I’m glad I was surrounded with the ideas, because it was accessible to me once I wanted to learn it. In general, I’m such a fan of the Internet. All of the people working at Friends are freelancers. That didn’t exist a few years ago, to be able to make a living as a freelancer. My life wouldn’t exist the way it does without the Internet. CreativeMornings is enabled by it, and with Tattly, I opened a global shop within minutes. Think about it. It blew my mind then, and it’s still mind-blowing now. But to my daughter’s generation, it’s normal. How do you think the idea of work is evolving in the digital age, and how does the concept of coworking factor into that? Young people are inventing a new sort of lifestyle. It’s more common to be a freelancer, to be pursuing a creative career and doing it on your own. As a result, employers need to adapt – if you want to get smart young people, you need to offer something more than just money. You need to offer freedom. If I could make a 32-hour work week possible, I would. I believe that everyone should have a day off that they can spend with family, or use to pursue art. If that keeps people happy and loyal to me, then that’s great. But most importantly, as a boss and as the founder of a coworking space, I try to provide everyone here with a community. When did you officially move into your new workspace — and what drew you here specifically? In your opinion, what are the building blocks of a successful coworking space? What’s something you’ve learned as you’ve built up these spaces that’s surprised you? It’s surprised me to see how much having a community like this enables you to be even more creative than you would be otherwise. If you want to live a creative life, you have to be courageous, daring, vulnerable – and you can only do that if you have strong support. Starting a workspace changed my life – I can say for a fact that I would not have started CreativeMornings or Tattly if it wasn’t for the support I’ve had around me. This – everything around me – is the reason that I want to come home a week early when I’ve been away on vacation. What’s in the cards for you the coming months? Any new ideas up your sleeve? This is the feeling I love most: the excitement of creating something new. I hate repetition. As soon as something’s figured out, I get bored. I’m so lucky that what I do is also what makes me happiest – I’ll never take that for granted. People ask me all the time how I balance my work life with my personal life, and really, there’s no difference. My life just is. Thank you so much for your time, Tina. To find out about all of Tina’s pursuits, visit her blog, Swissmiss – and check out her many other endeavors, including Tattly, CreativeMornings, Friends Work Here and TeuxDeux. 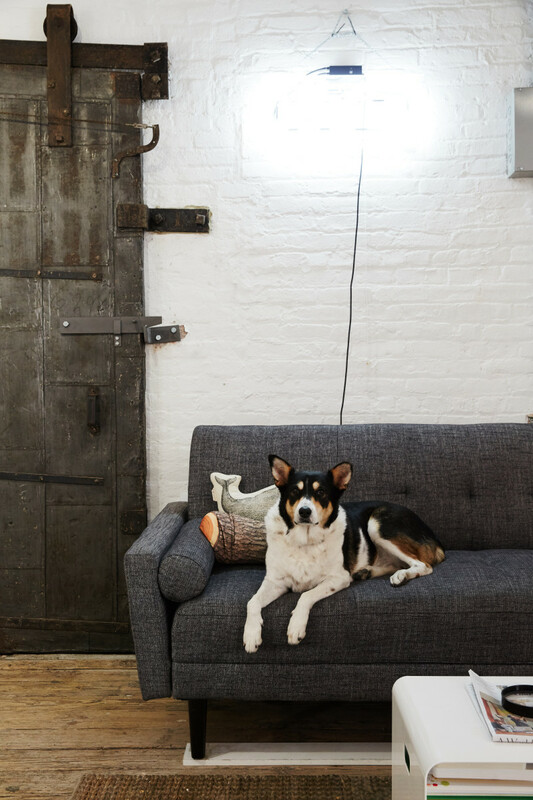 Head over to our archive to meet more creative and inspiring personalities from New York.